Hotel Handy Sea is a family-run 3-star hotel in Cattolica, located near the sea and just a few minutes walk from the Aquarium. It has a large outdoor swimming pool, underground garage (subject to availability), secure covered parking and free WI-FI throughout the property. Admits small pets. The hotel is located along the Viale Carducci promenade, very close to the sea and just 5 minutes walk from the Cattolica Aquarium. The area is also well served by public transport, with which you can reach the center of Cattolica in less than 10 minutes. The promenade is characterized by the presence of clubs, restaurants, ice cream parlors, shops and game rooms. All rooms have balconies (sea view on request), individually controlled air conditioning, WI-FI, telephone, minibar, satellite TV and digital terrestrial, electronic safe, ceiling fan and bathroom with hairdryer and shower. You can have breakfast in your room on request. 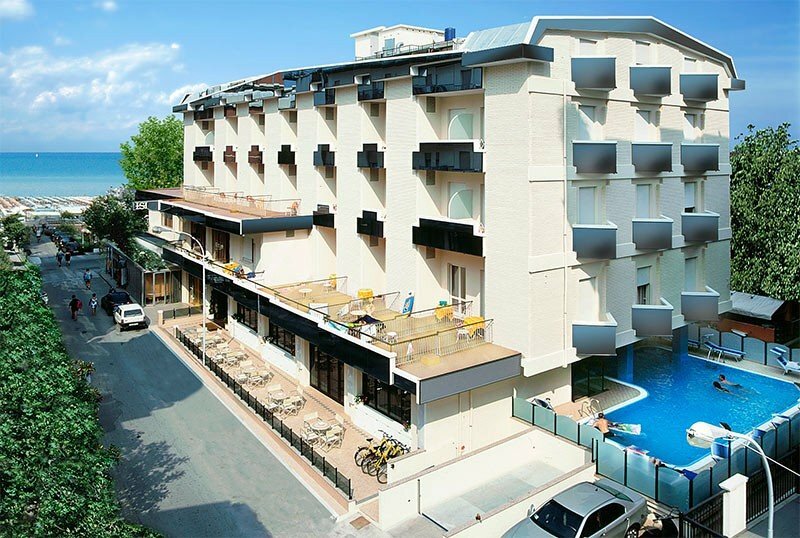 Heated swimming pool and Jacuzzi, solarium area equipped with sun loungers, terrace, free use of bicycles, living area with newspapers available, bar open 24 hours a day. PARKING: free, secure and covered (400 m from the structure) or alternatively private garage on request, subject to availability. LUNCH AND DINNER: 3 choice menu with meat and fish dishes according to the local tradition, always followed by a buffet of vegetables and cold side dishes, mineral water and local wine included. Pasta and desserts are homemade. VARIATIONS: the menu is suitable for vegetarians. OTHER: every Sunday an aperitif cocktail is organized. In the hotel: outdoor playground area, strollers and bicycle seats. Pediatrician on request. In the room: high side cribs and bathtubs for the bathroom. At meals: kitchenette for parents, seats at the table and vegetable broths with vegetables. At the beach: entertainment, mini club, tournaments and group games. The hotel has a 70 m² heated outdoor pool with hydromassage. The water is heated at a constant temperature of 26 ° C, the tank has a depth of 110 cm, making it suitable for children. Around the pool is the solarium area equipped with sun loungers and WI-FI areas. The hotel has an agreement with the Beach 96 beach club. It offers entertainment service, miniclub and baby dance. It also organizes tournaments, group games, musical performances and creative workshops. It also has a swimming pool with water games, hydromassage and waterslide. Prices are per person per day full board for a min. Three days. FULL BOARD: Full board + Water, unlimited wine with meals. ALL INCLUSIVE: Full board + Water and wine, beer and unlimited drinks at meals + Beach service (1 umbrella and 2 sunbeds on the beach, from the 4th row). - In case of early departure, one extra day will be calculated. Up to 6 years if a room with 2 adults or family package (2 adults + 2 children), one child is FREE! Children free up to 6 years. Valid for children in a room with 2 adults. a fantastic week at the seaside of Cattolica from only 336 € per person All inclusive, to relax in the tranquility that only this month can give you. Don't miss our super offers !! unlimited mineral water, wine, beer and soft drinks at meals. 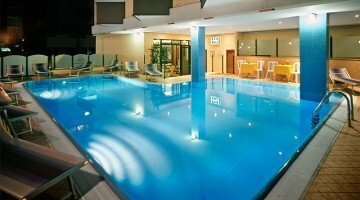 and if the sea water is still fresh, you can relax in our heated pool with whirlpool. 7 days all inclusive from only € 406 per person. What are you waiting for to book ?? When the sun burns and rises the desire to dive .. book your holiday! and lots of attention for your children.